Referred to as 'the street that never sleeps', Park Street is lined with restaurants and pubs and is always buzzing with tourists and activity, much like La Rambla in Barcelona or the Champs-Elysees in Paris. Anyone familiar with the city has explored Park Street by night, and so I decided to see how it holds up during the day. Long before Amazon ruined the romance of book browsing, this independent bookshop was flourishing on Park Street. 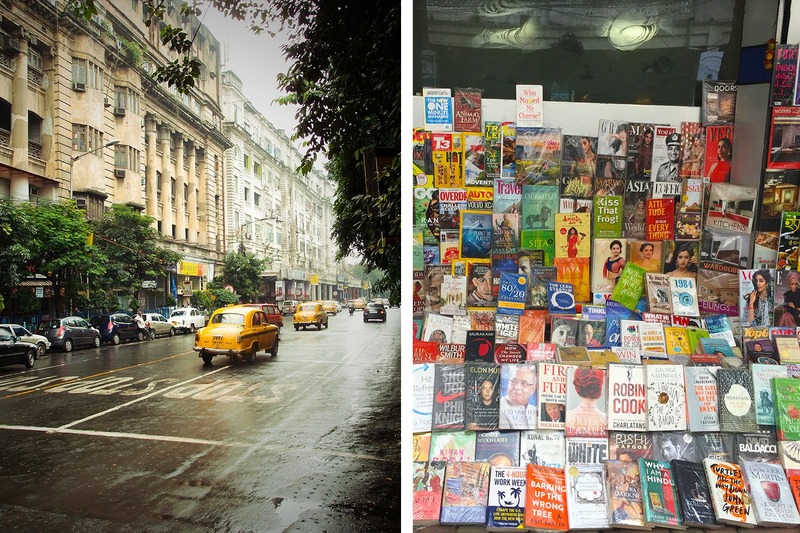 Established In 1979 and run by the Burman family, this little bookstore will whisk away into another world. With its chequered floor, narrow staircase and old fashioned bookshelves reminiscent of the medicine cabinets at a Diagon Alley Apothecary, it is extremely atmospheric. I half expected Mr Mulpepper to peer down from a ladder somewhere. The tiny place is well stocked, with everything from SAT prep textbooks to best sellers and classics sharing shelf space. Walk down the street from Family Book Shop and you’ll stumble across piles of books literally strewn across the pavement. You would have to be wearing blinkers not to veer off track, but fear not, this won’t burn a hole in your pocket. Although they don’t have the variety of a full-fledged bookstore, you will find a nice selection of best sellers, self -help books, poetry and magazines. The best part is you can bargain for the price you want to pay. As one of Calcutta’s older standalone gift shops Giggles has been serving up smiles for over 30 years. I used to frequent it as a child and remember the sense of wonder as I wandered the aisles discovering toys and wanting to buy everything in sight. After a brief hiatus of a year this Calcutta institution has re-opened its doors and it doesn’t disappoint. Brimming with 90’s nostalgia, you’ll find a wide array or greeting cards for any occasion you can think of. The rest of the shelves hold curios, mugs, party decor, board games, glitter tea lights and other kitsch. My personal favourites were the retro alarm clocks and superhero themed hipflasks. Sadly this is no longer what it was and is now just a few shelves of games. However, they have an amazing collection of rare old stamps and coins that the caretaker Satyanarayan Misra is happy to pull out for interested persons. Right across the road from Hobby Centre, on the corner of Park and Russell Street, is a stall that fries the freshest, flakiest most delicious Nimkies. I emphatically implore you to try these. If you want a healthier snacking option you can stroll down Russell Street to Shatrughan Sah’s Jhaal Muri stall. You can find him right outside Bombay Dying. His award winning (it’s proudly mounted on the wall behind him) muri is not to be missed. The secret ingredient being a special masala he prepares himself.